A warning, this is not the usual semi-romantic dog walking adventure you may have seen on this site before. It’s a grim reminder of a hopefully bygone era, today we are visiting the York Cold War Bunker. A retreat of safe haven in a time of unparalleled danger, in fact, it’s just the thing for surviving a nuclear blast. This has to be the ultimate man cave. As a child of the 70’s and 80’s brought up in the paranoia of the cold war and superior governance of a decadent western ideology, the cold war was a sense of impending nuclear doom but at least we knew who the baddies supposedly were. In the mean time, we went MAD (mutually assured destruction) and stockpiled some of what they had, just in case. 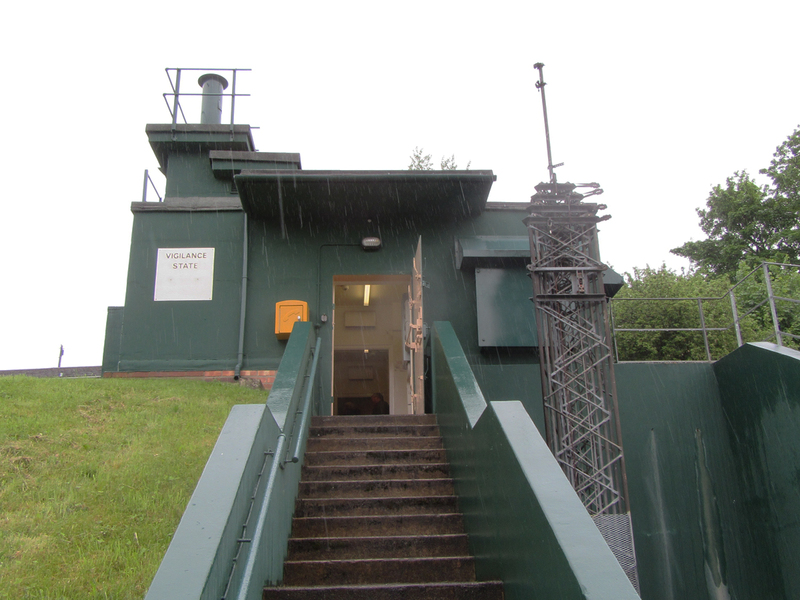 The York Cold War Bunker was purchased by English Heritage and restored to operational condition to become the tourist attraction you see today. 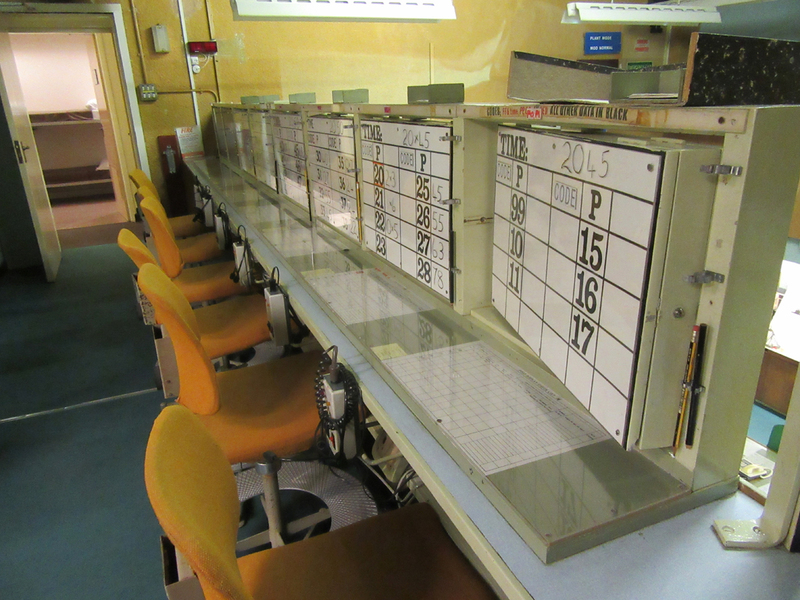 This was the protected headquarters of The Royal Observer Corps No. 20 Group in York and one of 30 such bunkers across the UK. The three-story subterranean site was built to withstand a 2 megaton nuclear bomb detonated from 8 miles away and designed to support up to 60 people for 30 days, in operation from 1961 to 1991. The sloped, rectangular, reinforced and waterproof structure is built into the ground and covered over with an earth banking to protect its staff from nuclear blast effects and radiation. They would contact regional monitoring stations and collate information that would help to triangulate any nuclear blasts, determine Ground Zero, radioactive fallout etc reporting back to government bodies. There were over 1500 monitoring stations in the UK and if you’re feeling a bit twitchy about Russian aggression or just twitching because you’re experiencing the effects of nerve agent poisoning, you can find a map of the monitoring stations here. Post display plotter board in the Operations Room recorded nuclear bursts on the rotating boards and plotted on triangulation boards. Entering the blast proof door we get a view of life inside the bunker. 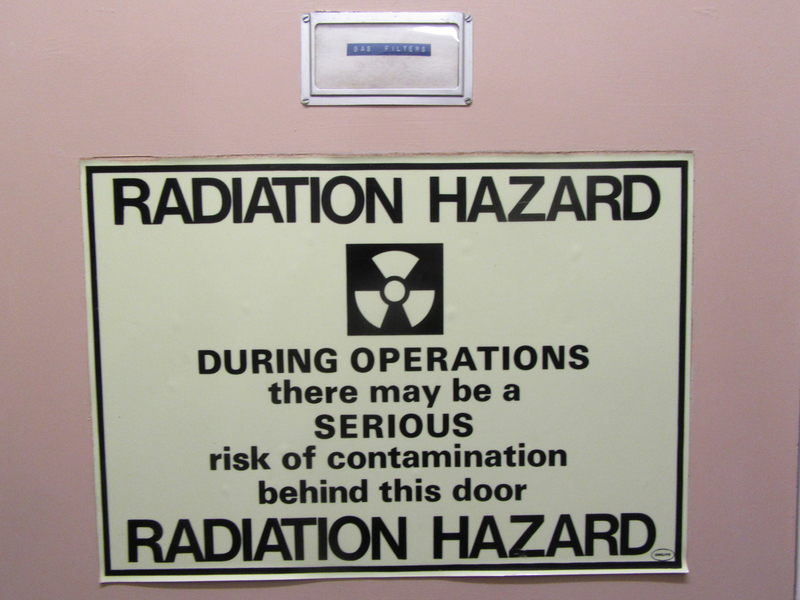 The sombre signs of Radiation Hazard on the door of the air filtration room and Attack State signs on the decontamination room greet you as you descend into the positively sealed bunker. As the tour progresses, we venture through the plant room, two basic 10 bed dormitories where you would be hot-bedding i.e. sharing (20 beds for 60 people), the canteen where your sole entertainment would be the grim faces of other people in the packed bunker. There isn’t a radio provided, news is controlled so you would receive only good news i.e. you might not think there would be much point in going on after a nuclear strike if you find out your family has been vaporised, burnt to a cinder or rotting from radiation. Maybe you’ll get some satisfaction from reading the Protect and Survive documents dotted around (or watch them on YouTube with that creepy jingle that’s played). The Operations Room is a hub of activity. Maps of triangulated positions with updates on fallout and blasts relayed from monitoring station are all coordinated here. The vertical perspex boards details the type of blast and wind direction for fallout etc. As the Cold War progressed, so did some of the technology with later additions of basic computers. The bunker has basic technology as there is less to go wrong in a strike, nuclear bursts have an Electronic Magnetic Pulse (EMP blast) that can fry the electrical gizzards rendering it useless). The addition of AWDREY, Atomic Weapons Detection Recognition and Estimation of Yield computer was designed to detect nuclear explosions and indicate its estimates size in megatons. Life below ground in the York Cold War Bunker would have been grim even with the colour scheme of green for calming and orange for work concentration. The AWDREY computer is not without fault, you would still have to have some poor soul go outside and replace the detecting paper, life above ground would be even grimmer, imagine popping outside to see god only knows what devastation. Feeling thoroughly depressed, we drive home to the soundtrack of Deutschland 83 in the car. Then its off home to watch something cheery like Threads, The Day After or perhaps a nice cartoon like When the Wind Blows. YouTube them if you really want to have nightmares. Strangely, it doesn’t make me nostalgic enough to grab my old RAF gear and don my NBC suit (Nuclear, Biological, Chemical Warfare suit), my haversack my containing an S10 respirator, Atropine Combopens (for nerve agent poisoning) and the Survive To Fight booklet. Protect and Survive information booklet. Reading for kids when the get bored. Survive to Fight. Cheery stuff. After having trained in this year after year, the novelty is about as much fun as radiation sickness. The Survive To Fight manual is decorated with a plastic see through cover on the front and an olive green plastic cover on the rear. Easy clean plastic for any nuclear fallout although you’d be buggered if you dropped it face down when its nicely camouflaged against the ground. On the front by a NBC suited soldier determinedly charging with his SLR and S6 respirator It gives you pictorial advice on what to do when the instant sunshine drops, the Immediate Action Drills, information on the hazard types from an airburst, ground or subterranean nuclear strike and decontamination procedures from radioactive fallout. Lovely stuff. If you can’t be bothered to read the manual, there is also the fun aide memoir fold out card dispensing helpful advice like ‘Be in time, mask in 9 (seconds)’ otherwise it kills you a couple of weeks later as you die coughing and spluttering in a convulsive nervous twitch. For those of you reading this who might want to know the casualty rates and effects of a nuclear blast on your home town, then try heading over to NUKEMAP where you can do just that. I’ve selected Nottingham as the nearest large city to me and detonated a single Cuban Missile Crisis era 2.42 megaton Russian R-12 SS-4 nuclear missile. Grim viewing. Incidentally, I mention this only in passing, there are some that may suggest that its no coincidence that the day the Berlin Wall came down, that I was informed that I was to be posted to Germany, the front line, at RAF Laarbruch. The Cold War was starting to thaw out. Clearly, I had the Russians scared on the run. Kind of glad that’s over. Its an interesting tour, we had a blast. 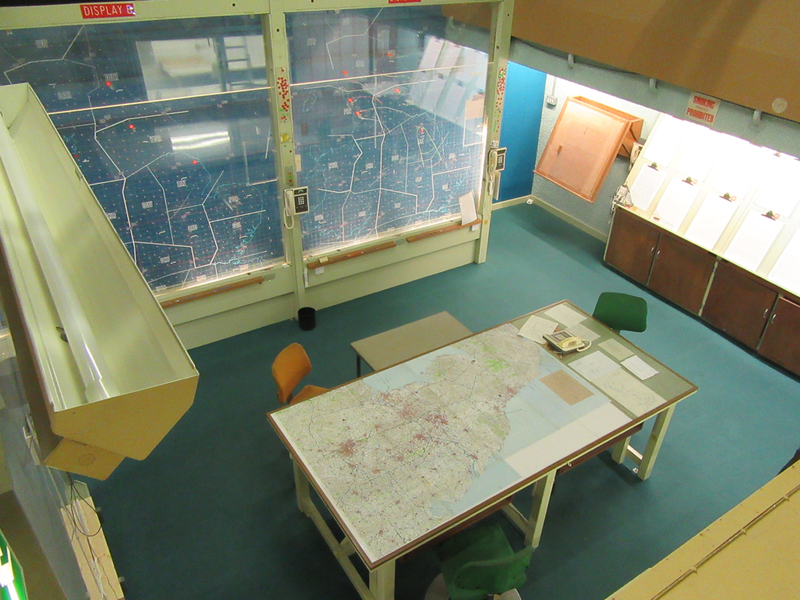 Find out more about the York Cold War Bunker at the English Heritage site here.